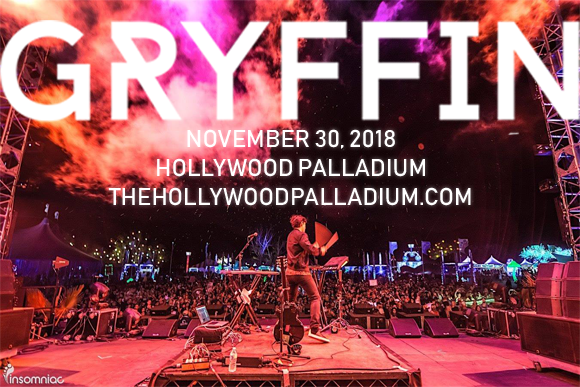 LA-based DJ and producer Gryffin comes to Hollywood Palladium on Friday 30th November 2018 for a super hot show playing all the best EDM! The "Tie Me Down" artist will be revving up the crowd with some insane drops and getting the dance floor pumping with some all killer no filler tunes! One of the freshest rising stars in dance music, Gryffin is set to take over the EDM world – catch him while you can! Tickets available now! American DJ, record producer and musician Gryffin is best known for his remixes of well-known songs such as Tove Lo's "Talking Body", Maroon 5's "Animals" and Years & Years' "Desire". He released his debut single, "Heading Home" (featuring Australian singer Josef Salvat), in 2016 via Darkroom/Interscope Records. The song was a success, peaking at number 22 on the Hot Dance/Electronic Songs chart, number 21 on the Dance/Electronic Digital Songs chart, number 1 on Spotify Viral 50 chart and number 5 on Billboard Twitter Emerging Artists chart. This year alone he has released three huge singles in the dance world: "Winnebago" ft Quinn XCII and Daniel Wilson, "Just For a Moment" ft Iselin Solheim, and "Tie Me Down" ft Elley Duhé.